The NFL is a tough business. Just ask defensive linemen Adam Carriker and Andre Carter. Both are former first round picks. Both are currently unemployed. Carriker, the 13th overall selection in the 2007 NFL Draft by the St. Louis Rams, was released by the Washington Redskins on March 4 after missing the 2013 season. He underwent three surgeries on a torn right quadriceps injury he suffered in Week 2 of the 2012 season. For the 30-year-old Carriker, his departure from the Redskins was quick and simple. He arrived at Redskins Park to continue his rehabilitation. When he walked through the door he was told to see general manager Bruce Allen. From there, Allen informed him of his release. And that was that. 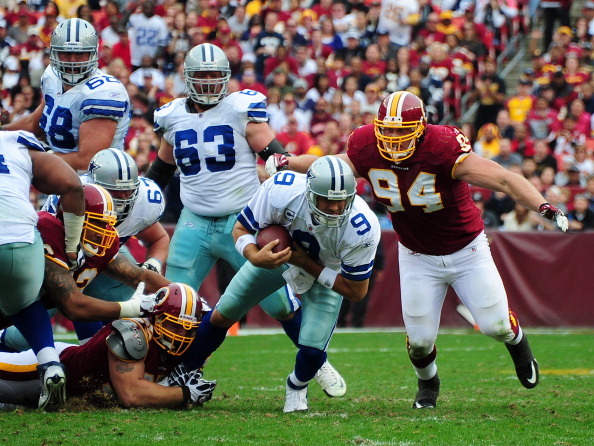 Adam Carriker chases down Dallas Cowboys quarterback Tony Romo at FedExField in 2011. Photo by Scott Cunningham / Getty Images Sport. Being cut by Washington didn’t come as a big surprise to Carriker. For weeks there had been rumblings of the seven-year veteran’s potential departure. He had only played in two of the team’s 33 games the last two seasons due to injury and cutting him saved the Redskins almost $3 million in salary cap space. “They made it perfectly clear that they still like what I bring to the table,” he added. Carter, the seventh pick in the 2001 NFL Draft by the San Francisco 49ers, was not retained by the New England Patriots this offseason after playing in nine games. He signed a one-year deal with New England in the middle of the 2013 season following his release from the Oakland Raiders in late August. Like Carriker, Carter had mixed emotions when he was released by Oakland. At 35 years of age, Carter, who has played 190 career games (regular and postseason) in 13 seasons, is approaching the end of his career but has never lost faith in his ability. NFL players have to be prepared at all times to face financial implications or even uproot their families from city to city should a release or a trade occur. Carriker lives in Colorado in the offseason with his wife Angie, son Jacob, 4, and daughters Addison, 3, and Trinity, 1. After his trade from the Rams to the Redskins in 2010, Carriker had to wait two years to unload his dream home in Missouri, all the while taking a loss on the sale. His home in Colorado was built just in case any future transaction involving him occurred. No matter where he plays from now on, he and his family would have a permanent home. Carter lives in California with his wife Bethany and son Quincy, 6. They also have a daughter Aysha, 20, who lives with friends. He has no worries about the stability of his family, be it geographically or financially. Andre Carter prepares to take on the Indianapolis Colts in the 2014 AFC Divisional Playoffs. Photo by Jim Rogash / Getty Images Sport. Carter says he has received minimal interest from teams at this point but is still working out in case he receives a phone call from a team saying they want him to sign on the dotted line. 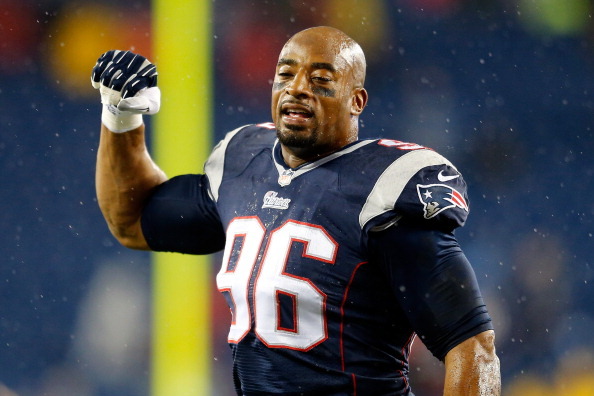 He reportedly worked out for the defending Super Bowl Champion Seattle Seahawks early last week. Carter’s workout regimen includes “field day” activities on Mondays, Wednesdays and Fridays to work on change of direction, speed, endurance and explosiveness; weightlifting Mondays though Thursdays; and Pilates on Tuesdays and Fridays with boxing intervals on Thursdays. Carriker has spent the last two months at the Andrews Institute in Pensacola, Fla. where he rehabs twice a day on his long road to recovery. Twice a week he works out for two hours in between his rigorous rehab sessions. He broke the Andrews Institute bench press record at the by benching 30 repetitions of 275 pounds. He has received interest from several teams that are eying his improvement and says, in terms of the recovery, he would equate his progress to being inside the 10-yard line looking to cross the goal-line. Having missed all of the 2009 and 2013 seasons, the former due to a torn muscle in his right shoulder, as well as 14 of 16 games in 2012, the thought of preparing for life after football hadn’t crossed Carriker’s mind much until lately. He sees working on a sports or business radio or TV show as a possibility. Another option could be coaching the local high school team near his home in Colorado. For Carter, a career as an NFL commentator could be in his future before long. He is currently working with current FOX Sports color analyst and former NFL defensive lineman Tim Ryan and voice coach Arthur Joseph to refine and polish his television skills. While their futures in the NFL remain unclear, Carriker because of injury and Carter because of age, their drive to continue to make their mark on the gridiron remains constant.